With its upcoming fall concerts, the Northern Tier Symphony Orchestra will feature a new Principal Trumpet Player. Bryan Carr (above) of Wyalusing has been moved up to the position, where he will be the leader of the trumpet section. In that role, he will advise the other trumpet players, and make sure the the section works together well. “I think the main difference is that Principal Trumpet ends up with a solo, and kind of sets an example for other trumpet players,” he said. Carr has been a member of the orchestra for two seasons. Carr is a 2011 graduate of Wyalusing Valley High School, and received a degree in music education from Mansfield University. He then took a job in Las Vegas, where he taught music, and also performed locally. 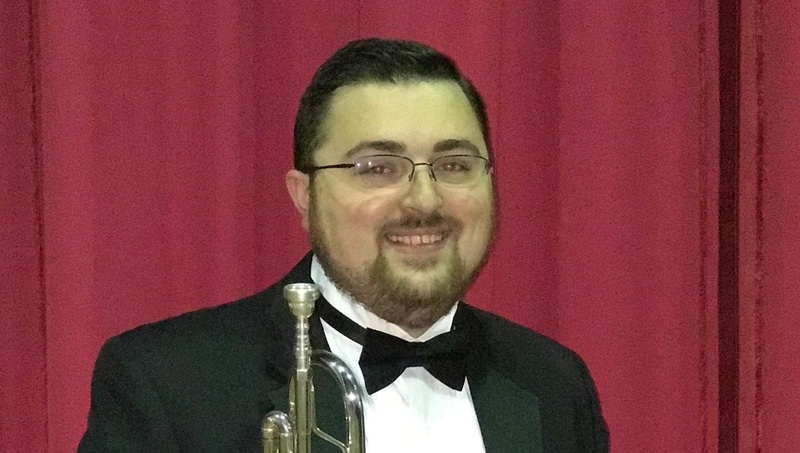 In 2016, a job opened up at his alma mater, and he accepted the position of band director in the Wyalusing Valley School District. He leads the elementary, middle school and high school bands, and also teaches music. Carr explained was recommended for that position with the symphony by his high school music teacher, Bob Shumway. Shumway is currently the lead percussionist with the symphony. The orchestra, led by music director and conductor Robert Helmacy, will perform two concerts for its fall season. The first is set for Friday, November 17, at the Peckville Assembly of God Church in Blakely. It will be followed by a performance on Saturday, December 2, at Tunkhannock Area Middle School, during the annual Christmas in Our Hometown festivities. All shows are scheduled to start at 8:00 p.m. The concerts will feature music from the opera “Hänsel und Gretel” by 19-century German composer Engelbert Humperdinck. All seating for the concerts is general admission. Tickets are $10 for adults and $5 for children and students. There is also a special student group rate of $4 per person for groups of 10 or more students; one free adult ticket is included with every 10 student tickets. Tickets can be purchased at the door, or at the following locations: Gay’s True Value Hardware, 189 E. Tioga St., Tunkhannock; Greenwood’s Furniture, 61 E. Tioga St., Tunkhannock; and Peoples Security Bank, 42 State St., Nicholson. Tickets can also be reserved by calling 570-981-9006. The Northern Tier Symphony Orchestra was founded in 2010 as a non-profit community orchestra with the goal of bringing live classical music to the Endless Mountains region of Pennsylvania. It is based in Tunkhannock, where it presents several concerts each year. Concerts are also presented in other communities.